The last few months at Granite Hill School have been exciting! 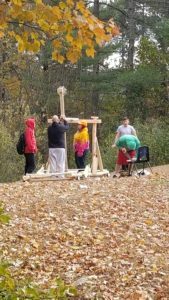 At the end of October all school members participated in our 2nd Annual Punkin’ Chunkin’ event. Students and staff worked in teams for one week to create a device that could throw a pumpkin as far as possible. This event was the culmination of Fall Spirit Week which included days like Sports Day and Costume Day. GHS has also had some other exciting events. The Middle School students took a field trip to the local polling station to learn about elections and in mid-November the entire school came together again for our annual Thanksgiving feast. Copyright 2018 Granite Hill School. All rights reserved.